Honey may be sweet but it’s that kind that is good for you. Compared to refined sugar that is made of pure carbohydrate compounds Honey is more complex, containing sweetness but also with essential vitamins and minerals essential for proper bodily functions. Some of these nutrients are capable of lowering bad cholesterol levels. Honey has antioxidants that can be very helpful in fighting free radicals that destroy cells and cause cancers. Honey is sweet but it has a protective benefit to the body. It can be very helpful but it needs to be used in a controlled manner since it contains fructose which could still add up to your sugar intake. Honey is a very helpful product that can help lower bad cholesterol. According to published clinical studies. 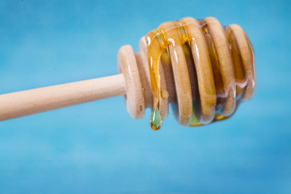 The levels of LDL have dropped 5.8% with the help of honey replacing most sugar products in a regular diet. The participants had significant drop in bad cholesterol levels. In terms of good cholesterol, the research concluded that there was an increase in HDL levels upon introduction of honey in the diet. It may not be as significant as the LDL decrease but nonetheless, it shows that replacing regular sugars with honey can change cholesterol levels of the body and benefit you. It has been proven that almonds are very useful in lowering the risks of high cholesterol levels. When used with honey as snack or as alternative ingredients to foods like baked products, the person can have antioxidant and cholesterol busting effects that help minimize the risks of heart diseases. In terms of weight loss, this may be a very important aspect especially in starting out with a healthy diet since even a seemingly healthy person can still have high levels of bad cholesterol, increasing their risks of heart diseases. Using almonds and honey as snack is good but it should be used in controlled manner. Fats that we feel in our gut and sides are those resting fats that add bulk to the body. Honey was believed to have that fat stimulating effect. The idea is that honey can help mobilize the fats, allowing it to be used up by the body and with consistent burning; it could result to a trimmer body and lesser fat deposits. The recipe includes equal parts of honey and warm water. Get a spoonful of the mixture and take it in once a day. This can help increase the fat burning process and ensure that you lower your weight. Lemons are known for their lovely aroma and nutritional benefits. When combined with honey, they make a perfect combination. They also offer that fat burning benefit as well. For some diets, they combine maple syrup instead of honey to the lemons. For weight loss, mix equal parts of lemon juice with the honey and then drink a considerable amount every morning. This can help fire up the metabolism while getting essential nutrients and antioxidants. Boil honey and water and cinnamon together in a saucepan and then filter. Drink this an hour before getting breakfast and before heading to bed. This will also help in weight loss. The Atkins Diet, Does it Work and is it Healthy? What Are the Advantages of Breastfeeding?